Before Queen Anne (Anna? Ana? There are lots of different spellings out there.) was the Queen of Spain the position was previously held by three women. Queen Anne was the fourth wife of King Phillip II of Spain and she had a lot of ex wives to compete with. Besides that, the pressure was on for Anne because Phillip II had yet to have a baby prince to take over the throne once Phillip II went to the great throne in the sky. All of Phillip’s previous wives had either died before they could have a boy or the boys died before they could be king. 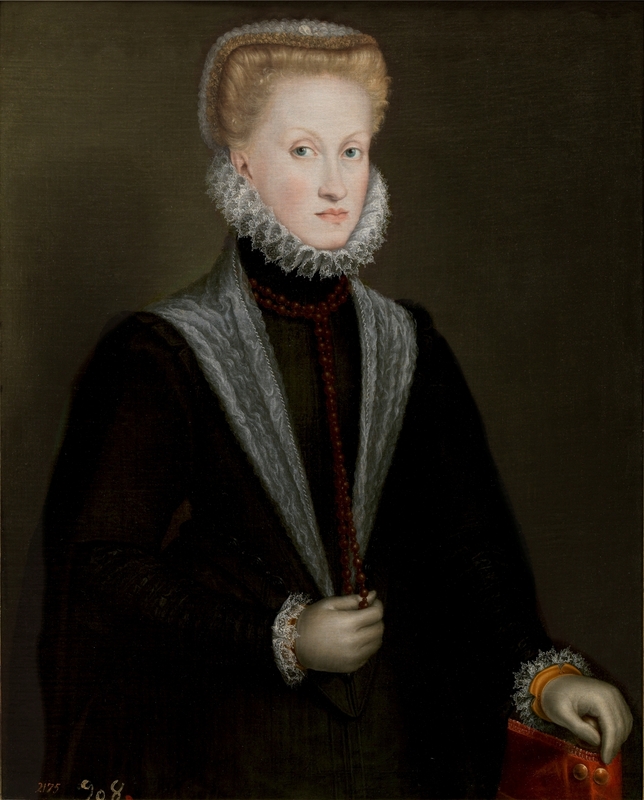 Anne had actually been intended for Phillip’s son and her first cousin, Don Carlos. When he died (before becoming king), Anne’s wedding was expedited and the groom became her uncle. And if that wasn’t gag-worthy enough, she was 20 years old and he was 41 on their wedding day. Despite the massive age gap (or maybe because of it) Phillip couldn’t get enough of his niece and would “visit her bedchamber” up to three times a day. Not too shabby for a man who, by 1573 standards, was positively geriatric. It all paid off, though because Anne was able to muster up one boy who survived to adulthood out of all seven of her pregnancies. Around the time of their wedding, Anne decided she’d get rid of the memory of one of Phillip’s other squeezes. Phillip had a portrait, one that he actually is said to have liked a lot, that was also painted by Anguissola. In 1573, Anne commissioned Anguissola once again, just as she was on her way to retirement, to paint a portrait of the new queen in the fanciest stiff, starched, dark fashion of the Spanish court. She then told Anguissola to paint over her husband’s old portrait to cover up all of his fancy, flashy garb from an earlier era and make his portrait just as stiff, starched, and dark as hers. I guess when you’re niece, wife, and mother to the only living prince you get what you want! Martin Mutschlechner, "Philip II: marriages and offspring," The World of the Habsburgs, , accessed July 28, 2017, http://www.habsburger.net/en/chapter/philip-ii-marriages-and-offspring.